Existing fence in bad shape, tear down (need to discuss with neighbor though). There is a slope/grade between my property and the neighbors, which the fence is in the middle of. I need to remove two small trees and some of the bamboo. Fence will line up with garage, about a foot north of the southern property line. Neighbor’s garage is 1 ft south of property line. Need to remove some concrete on the ground near where the gate will be. Leaving the bushes on the south side of the driveway alone for now. Angling the fence per vision clearance guidelines (see below). Fence is in decent shape, just not very good fencing. Gate on north side is super janky. Removing and replacing entire section, and extending the 6′ section north to the 20′ line, just a little south of the house corner. A dead tree intersects the current fence which I will need to remove. It was pointed out to me that if a vehicle needed to access my yard they would need a way to do it, hence a larger gate at the top. Vision clearance area regulations means no fence higher than 30″ (2.5 ft) can be built along most of it. Not sure what I want to do with this area. 1. 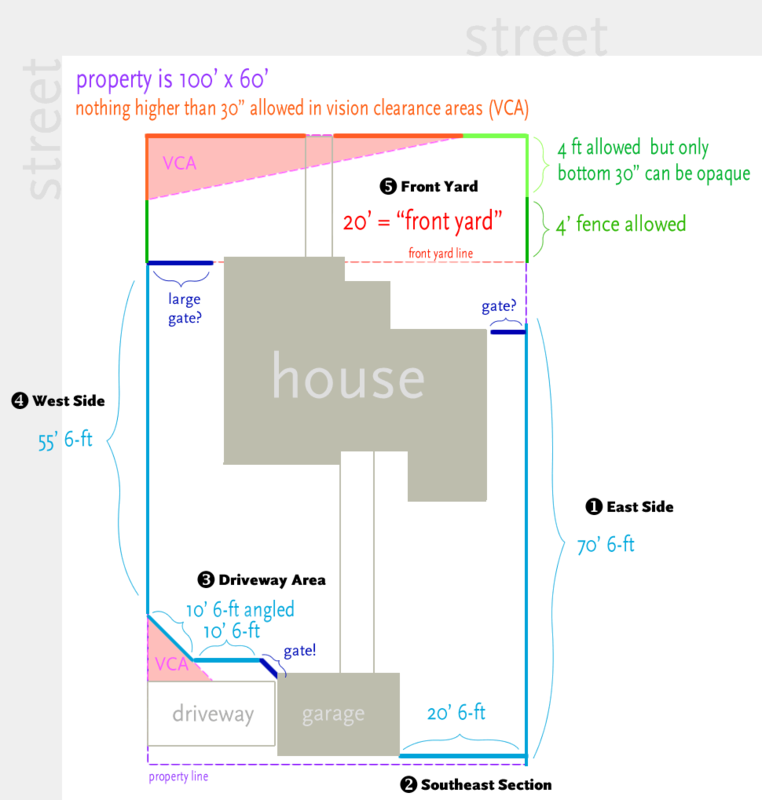 Are vision clearance areas measured from the property line or the curb? Vision clearance area: the publicly and privately owned area adjacent to an intersection within the legs of the triangle as determined according to the regulations provided by this chapter which must be sufficiently free of obstructions to provide safe visibility for vehicular, bicycle, and pedestrian traffic. The legs of the triangle shall be measured along the property line. 2. What is the vision clearance area for my corner? At controlled intersections, the vision clearance area shall have 10-foot by 50-foot legs, with the shorter leg along the controlled street and the longer leg along the uncontrolled street. 3. What about my driveway? There shall be a vision clearance area on each side of any driveway or alley intersecting a street or alley. For driveways serving single family and duplex dwellings, the vision clearance area shall have 10-foot legs along the driveways and along intersecting streets or alleys. 4. What kind of fence could go in a vision clearance area? A vision clearance area shall not contain temporary or permanent obstructions to vision exceeding 30 inches in height above the curb level.